I lived in L.A. for about 3 years, in that time I painted a few murals. My most visible outdoor murals were painted at a video/movie memorabilia store called Eddie Brandt’s Saturday Matinee in North Hollywood. This place is well known in the film industry as the place to get hard to find titles from the past. Famous actors, directors and producers frequent this store. They have over 72,000 titles! I can spend hours in there. The place is amazing. 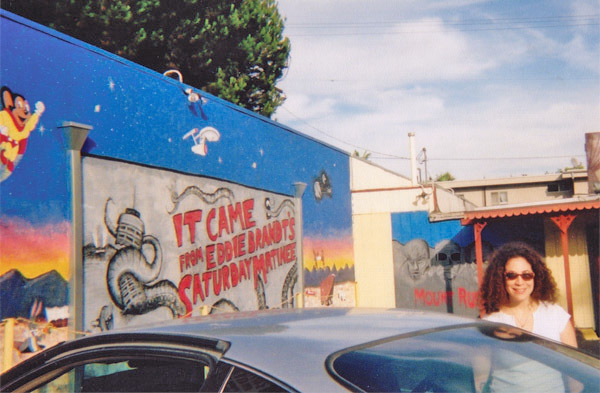 Since I painted the main “It Came From Eddie Brandt’s Saturday Matinee” mural in 2001 & Mt. RushMonster in 2002, there has been much press about the store. What’s great, is that a picture of one of my murals usually accompanies the story or blog. Here’s one blog with some great photos. In 2008, Pat Swovelin shot a very cool spherical panorama shot of the exterior of the store. Also in 2008, Eddie Brandt’s was featured on a promo spot for Turner Classic Movies called “Fanatics” in which they showed one of the murals. Pretty cool. Unfortunately, these murals have seen better days. The main mural has been targeted by taggers who had a problem with the “Blues Brothers” police car and for some reason, Bugs Bunny (I’m looking at you, Elmer Fudd!). Sadly, this is the condition in which the mural is shown. My hope is to overhaul this mural and clean it up so if it’s shown again, it will be graffiti free. Any excuse to go back to that amazing video store.